In January I am part of a group show called IV at the Curwen Rectory Gallery on Fournier Street, London, E1, celebrating their yearly Hot Off The Press exhibition. 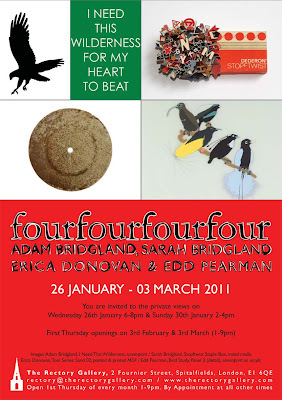 IV exhibits the work of four artists that have been part of the Hot Off The Press shows in the last few years. I was selected for this showcase after I graduated from the Royal College of Art in 2006. The other three artists showing are Sarah Bridgland, Erica Donovan and Edd Pearman. The show opens on the 26th January and is then open on each first Thursday in February and March and by appointment until 3rd March 2011.